"The story is breathtakingly laid out . . ."
In The Bone Labyrinth, author James Rollins has created a labyrinth that includes giant hybrid gorillas in the Beijing Zoo, the lost continent of Atlantis, the bones of Adam and Eve, the genetic source of human intelligence, lost recorded minutes of the moon landing, numerology and the Bible, and the list goes on. Truly a Gordian Knot of amazing proportions. One of Rollins’ strengths in his Sigma Force novels is his development of a protagonist on multiple levels with multiple characters. The primary team—Director Painter Crowe, Commander Gary Pierce, Dr. Monk Kokkalis, Joe Kowalski, Captain Kathryn Bryant (Kat), and Seichen are swept into the search for the clues to mankind’s history buried deep within the human DNA. The group is forced to separate as clues draw them across the planet, with much of the activity taking place far beneath the planet. Rollins starts out with a scene played out in 38,000 B.C.E. in the Southern Alps, as a father and daughter race to escape a “mighty enemy” that was hunting for “special ones”—hybrids born of a union between Neanderthals and homo sapiens. The daughter was such a hybrid, and her life hung in the balance. As with all of Rollins’ chapters, this introduction brings the reader to the edge of the cliff, as the father and daughter meet another tribe—one that includes many of these same hybrids. The father turns to face the onslaught from the enemy while the daughter leaves with this other tribe, leaving the reader wondering what may have befallen the girl. 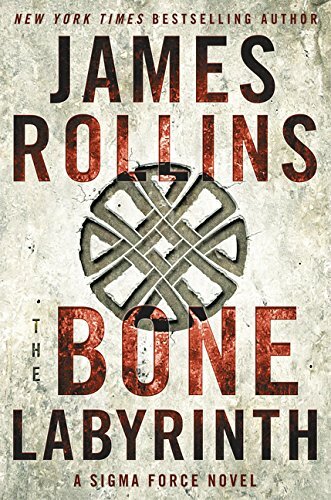 Rollins deepens the mystery in the second chapter set in 1669 in the Papal States in Rome, where Father Arthanasius Kircher is introduced to a map that may hold the secrets to the existence of the bones of Adam and Eve. Turn the page and the next scene takes the reader to a recently discovered series of caves in Croatia that house more mysteries into what Father Kircher was searching for. As young geneticist Lena Crandall and Jesuit priest, Father Roland Novak join the search into these caves, their group is attacked by a dark military force that captures the other members of the group but Crandall and Novak escape. As the information regarding this attack reaches the director of Sigma, Painter Crowe, he informs Commander Gray Pierce and alerts him to a connection between the attack and a research center in Atlanta Georgia. That connection is Dr. Crandall’s twin sister, also a geneticist, Dr. Maria Crandall. Fearing for her safety, Sigma Force members Kowalski, Monk, and Kat are sent to Crandall’s research center where the focus of her work is with a hybrid gorilla, Baako. Black forces are also focused on Baako, and in a daring raid, kidnap Maria, Kowalski, and the little gorilla, and sweep them off to Beijing where they are taken to a research laboratory located under the Beijing Zoo. The Chinese are driven to establish a superhuman race through research into the engineering of the human genome but it is apparent that in order for the Chinese to succeed in their goal, they must also learn from the mysteries of thousands of years of human development that are buried around the world. Enter the antagonist Major General Jiaying Lau, truly one nasty piece of work. Arrogant and aggressive—a true psychopath—Lau has plans to settle the mystery of human development by studying Baako and she will let no one stand in her way. While Kowalski and Maria Crandall fight to save Baako, Monk and his hand-picked team track a GPS signal that had been attached to Baako, while the rest of the Sigma Force team, with Lena Crandall and Roland Novak, follow the crumbs left by Father Kircher almost 700 years earlier. The maze of clues and artifacts continues to tighten the Gordian knot, drawing all of the Sigma Force team closer together, with two climactic battles—one in the depths below the Beijing Zoo and the other in deep caves beneath Ecuador in South America. The story is breathtakingly laid out, with Rollins combining true historical figures with mythological events, and an exciting fictional account of a battle for mankind. The ending is poignant and deserves a Kleenex or two, but also leaves open the door for another decade of Sigma Force stories to grace our library shelves.